A properly designed landscape adds interest to your yard, increases curb appeal, and can increase the potential for your family to more thoroughly enjoy their surroundings. As professional landscapers the team at Hutcheson Horticultural knows the best techniques to enhance your yard. Here are some of our favorite techniques to add color, texture, functionality, and points of interest to your landscaping. Evergreen trees and shrubs retain their leaves or needles all year long, so they’re constantly providing cover and color. This gives you some interest even in the winter. Evergreen plants strategically placed near the house, such as in front of corners, can help soften the vertical lines of the house, giving it a more inviting appearance. Instead of trampling down the lawn, resulting in a makeshift path of dead grass between your patio, fire pit and garden, create an attractive walkway using concrete stepping stones, natural flagstone, decorative brick or crushed stone. “It’s all about connecting elements in your landscaping to pull those elements together. We advise constructing a pathway, walkway or any other landscaping feature from material that’s the same or similar to what’s used on the exterior of the house, such as a brick or stone, because it will tie the path aesthetically to the home. Or use the material to provide a striking edging along the walkway. A water feature, even a small, self-contained unit that stands alone on a patio, should look like it belongs in its surroundings. You can use natural stone or the same material that you find on your home. You should not however use too many materials or the effort may backfire. A good rule is to use no more than three elements in one area, or the area can get too busy. Choose a diverse range of plants that bloom at different times so ornamental leaves will be visible all season long. Otherwise, if all the flowers bloom at the same time, they’ll look attractive during that time frame but will lack color the rest of the year. 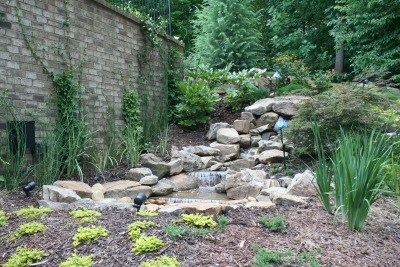 If you are ready to make enhancements to the landscaping of your home or business. The professional landscapers at Hutcheson Horticultural in Woodstock are prepared to assist you in designing and installing a landscape to meet all your wishes. You can call us at 770-924-1001 or use the “Contact Us” feature on our website.